I got home from Shetland Wool Week just in time to leave again for Inverness and straight on down to Glasgow! 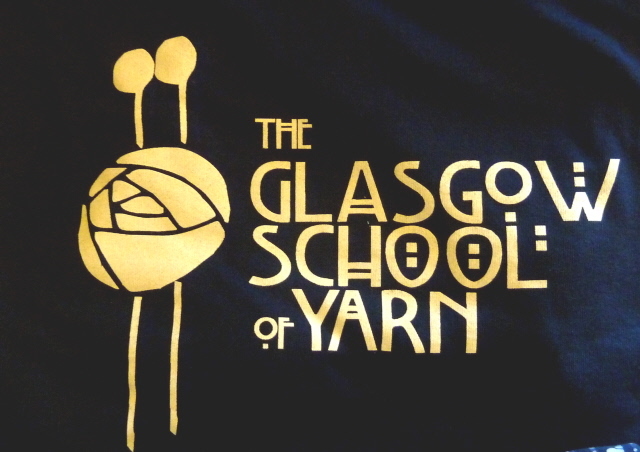 There, I was teaching at the second Glasgow School of Yarn organised by Antje of The Yarn Cake, a real yarn and cake shop in Glasgow’s West End. 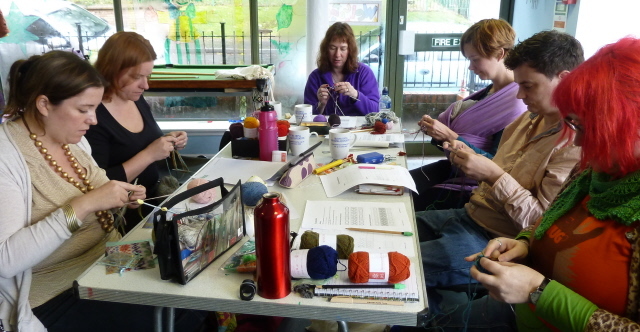 It is very difficult to take pix of knitting workshops! 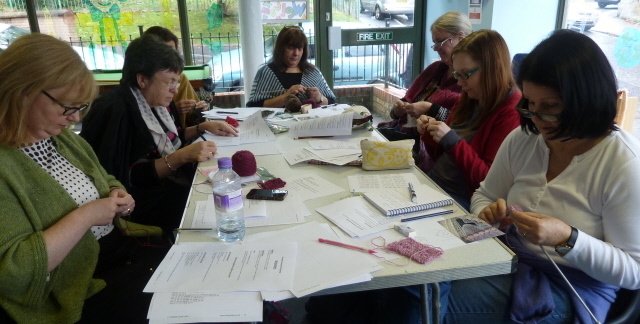 Here are a couple from The Fair Isle classes on Friday…. On Saturday afternoon I was teaching a class called ‘Spinning Finer’. 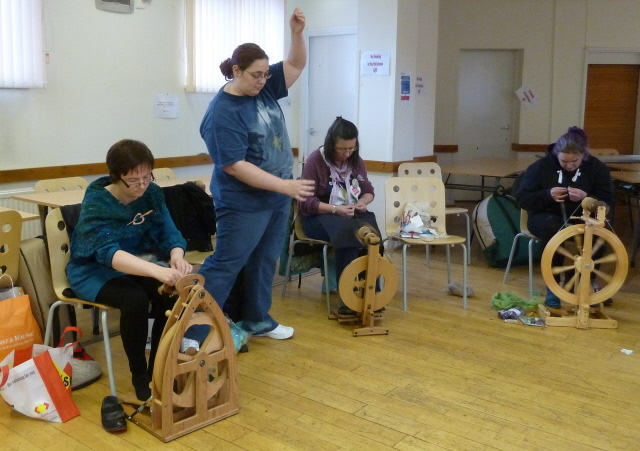 I was surprised how many people had actually brought a wheel along with them, rather than spindles. Spinning is more photogenic! Not only was the whole couple of days well organised, the tutors were cared for so well, and the goodies were terrific! Even a t-shirt in my size…. I was in the same hotel as Woolly Wormhead, and we traveled as far as Queen Street station together. My train went out first, and I had a lovely journey back, with most of it in glorious sun. The line is a scenic one. 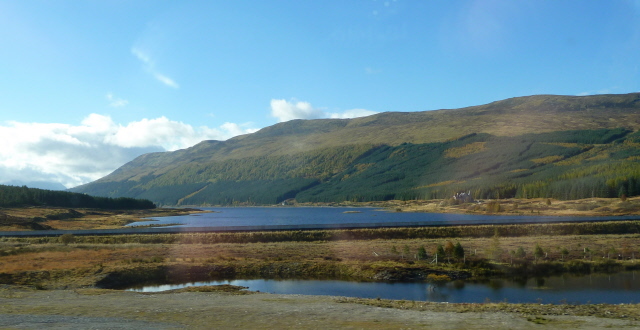 First there is a fertile Central Belt, with lots of autumn colour – vivid yellows, oranges and reds, but mainly too close to the train to photograph. 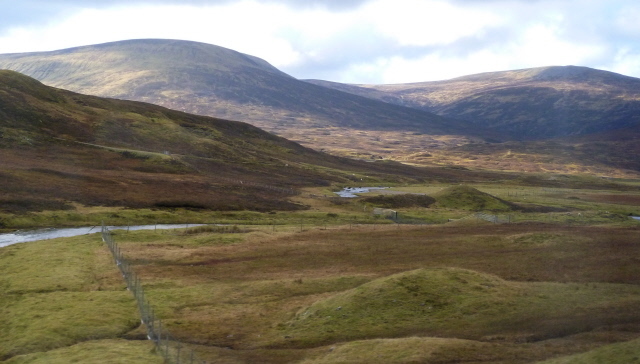 Then the rolling hills of Perthshire, which become the mountains of the Cairngorms. These could be called bleak, but I love the open, tough views, peopled only by sheep. During the journey I was able to work on the Ha’af Cap I am knitting in the new J&S yarn. It was thefirst time I had had a chance to just sit and knit for a couple of weeks. It was bliss…! Stories and people and landscapes make me smile. So does the t-shirt design! I’m happily researching more sheep stuff here. Isn’t it all a treat? 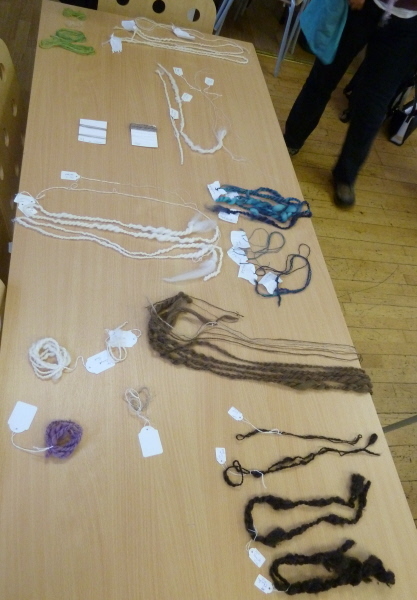 I wish I’d known about The Yarn Cake when I had my day-and-a-half in Glasgow a couple of years ago, although I did have a fine time touring the Glasgow School of Art and the Kelvingrove, and simply walking around the city. The t-shirt design is brilliant, isn’t it?! 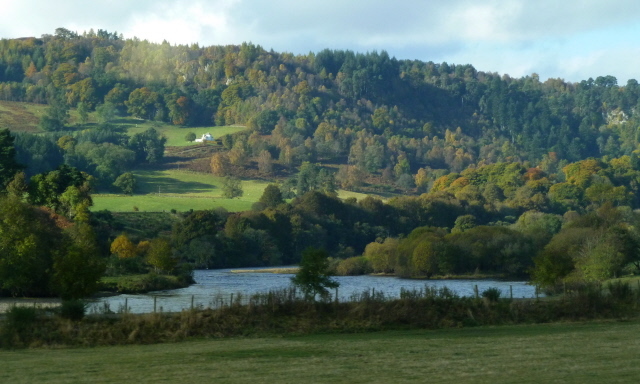 the base for the weekend is one of the Macintosh churches so it all fits so well…! Thanks for coming to our little yarny get together! What a nice post. Glad you had fun and a pretty trip. You take such beautiful photographs. Looked like very dedicated students. You’ve made my fingers itch to try spinning. They were a very dedicated bunch in each class – they all worked really hard and were a pleasure to teach. 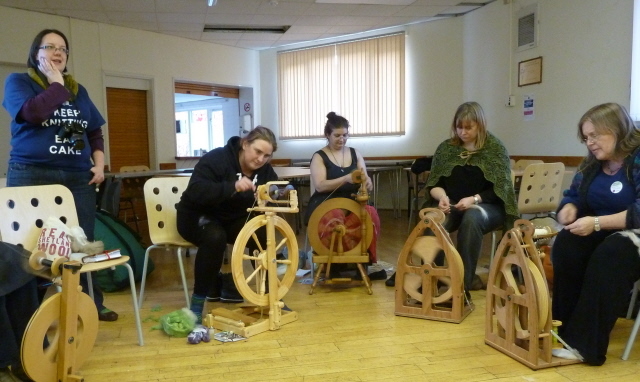 Spinning is great – but addictive…! Sigh…one of these days….sorry about turning your screen bright green with envy! 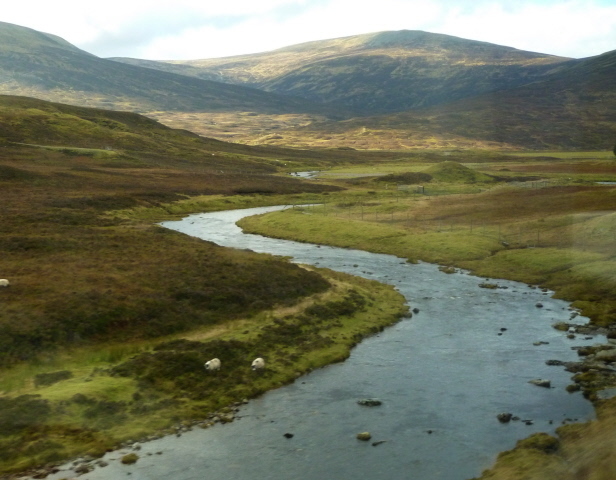 Beautiful scenery on the train trip!! Looks like everyone in your classes is having a good time. Not bleak at all! (Lucky for us the sun was shining, though) Beautiful photos as usual. Thanks for sharing.